Recently we loaded up the car and headed south to visit the Texas Hill Country to see the wildflowers in bloom. While not as prolific as some years, the thick patches we found did not disappoint. It's so exciting to see a massive carpet of blue across our usually green hills, and I love how the bluebonnets signal that spring has arrived! Our last stop on our Texas adventure was stopping closer to home, near West Texas. The explosion of wildflowers was amazing with practically every color in the rainbow represented. This field was so beautiful that I had to stop and paint it! Even recreating the scene filled me with such joy and contentment. I hope you, too, can feel the elation and energy of springtime in Texas. 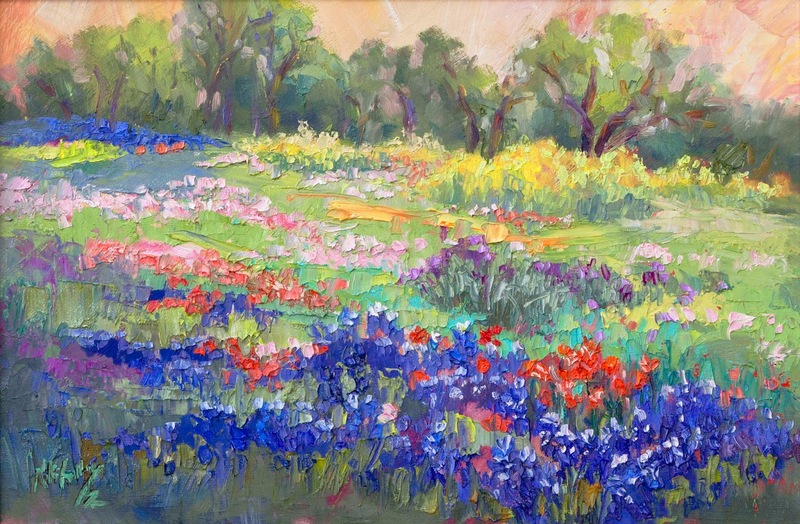 I painted these Texas Bluebonnets and wildflowers with extremely thick oil paint and palette knives to achieve depth and texture. The resulting image comes to life and is loaded with color and movement. In this wildflower series, I've framed the paintings in espresso with linen liners to focus your eye on the painting and not the frames. These Texas wildflowers look great hung alone or in a grouping with the rest of the "April's Palette" series!